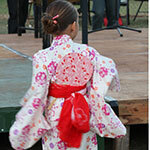 There are annual events which entertain and educate us here on Molokai. Here are some of our favorites. The "Makahiki" is a designated period of time following the harvesting season when wars and battles were ceased, tributes and taxes were paid by each district to the ruling chief, sporting competitions between villages districts) were organized and festive events were commenced. Ka Molokai Makahiki is committed to preserving these ancient traditions, especially those specific to Molokai. Through a series of lectures, land and ocean activities, hands on art and craft workshops, sporting competitions, oli composition competitions and traditional ceremonies, the Makahiki is alive and well on Molokai. Held from 7:30 am to 4:30pm at the baseball park across from Mitchell Pauole Center in the heart of Kaunakakai Town. 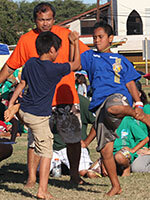 The Makahiki Committee has a variety of trainers and training materials to assist others in organizing their own Makahiki Games. Since 1995, The Nature Conservancy has sponsored Molokai Earth Day. The purpose of the event is to educate residents and visitors about the part they can play in preserving our natural and cultural resources. The event will be held from 5:00 pm to 9:00pm at Mitchell Pauole Center in Kaunakakai. There will be ono food, great entertainment, lots of prizes and educational displays. Come join us in celebrating Earth Day. For further information, please contact The Nature Conservancy 808-553-5236. Hawaiian Educational Ho'olaulea (Festival) to benefit Punana Leo O Molokai. Festival includes Hawaiian Music, Crafts, Food Booths and Keiki Games. Held at Lanikeha Center in Ho'olehua from 9:00 am to 5:00 pm. Free Admission. For further information, contact: Punana Leo O Molokai weekdays at 808-567-9211. "A celebration of the birth of the hula"
Join Molokai and the rest of Hawaii as we celebrate the Annual Ka Hula Piko Festival at Lanikeha Community Center in Hoolehua on Saturday, June 6 from 9:30 am to 4:00 pm. A full day filled with Hawaiian and local craft booths, 'ono food, doorprize giveaways, a silent auction and the official Moloka'i Ka Hula Piko t-shirt. Entertainment by various Moloka'i groups and Hula Halau. Admission is free! 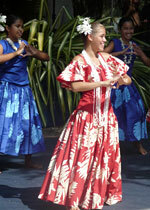 According to Moloka'i tradition, the art of Hula began on the island of Moloka'i in the district of Ka'ana. Join us as we share the mo'olelo (story) and hula (dance) of this sacred place. Head West past the airport along Maunaloa Hwy. Look for the cars parked alongside the road. "Obon is a long honored Japanese tradition of remembering with love and gratitude our departed ancestors." Obon Service 5:00pm, Bon Dance and Taiko Performance to follow. Held at the Soto Mission - Behind Kanemitsu Bakery. An international field of more than 200 paddlers take on the 32-mile course across the Kaiwi Channel in the Molokai to Oahu Paddleboard Race. Considered to be the world championship of long distance paddleboard racing, the event has been won by Molokai paddlers and those from as far away as Australia. This year's event promises to be one you won't want to miss. Starting at Kepuhi Beach, Kaluakoi on Molokai at 7:00am and finishing at Maunaloa Bay, Oahu around 12:30 pm. For more details visit http://www.molokai2oahu.com/. 12th Annual Nationally Sanctioned Event. 25 Target - Marked Animals. Divisions include; Freestyle, Barebow Bow hunter, Barebow Freestyle or Traditional (Recurved or LongBow). Age groups include: Cubs (11 & Under), Youth (12-14), Young Adults (15-17), Adults, (18 & above), Guests and Olympic Class. Entry forms and event details can be obtained by contacting the Molokai Bowhunters Club at http://www.molokaibowhunters.com/. Spectators are welcome at no additional charge. Event apparel as well as food & beverage booths will be available at the tournament. The funnest downwind race in Hawaii! 5:00 pm to 10:00 pm - Kaunakakai Town - Free Hawaiian music and other fine entertainment. Made on Molokai arts and crafts, great local food and drinks. A celebration of Molokai canoe races! For over 50 years the Festivals of Aloha has brought the Molokai community together with their Royal Court, onolicious food, fun games, dance and memorable entertainment. October 8 - Parade through Kaunakakai Town, 9:00am, followed by day-long Ho'olaulea at the baseball park across from Mitchell Pauole Center. 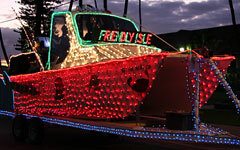 Santa comes to Kaunakakai with the annual Christmas Light Parade, which features only-on-Molokai floats and marching units.